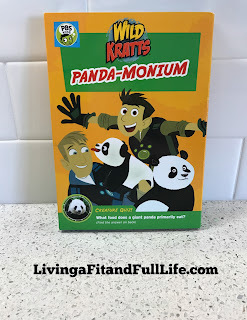 Living a Fit and Full Life: Learn All About Pandas in the New Wild Kratts: Panda-monium DVD! Learn All About Pandas in the New Wild Kratts: Panda-monium DVD! Join Martin Kratt and Chris Kratt as they learn about some of the amazing creature features of giant pandas, red pandas, and other incredible animals! In four action-packed adventures, the brothers save giant pandas from the evil Zach Varmitech, find an adorable little lost red panda and help to reunite her with her mother, save animals captured in China from the villain Donita Donata, and more! Wild Kratts: Panda-monium DVD is an absolute blast for kids! My kids love Wild Kratts so I knew they'd love this DVD. They enjoyed learning all about pandas all while going on an adventure with the Kratt Brothers. As a homeschooling mom of 4 I love how educational the Wild Kratts DVDs are and love turning them on for my kids as a break from our lessons. Wild Kratts: Panda-monium is an action packed DVD that entertains kids all while educating them about various pandas. It's a super cute DVD that my family and I adore and highly recommend! 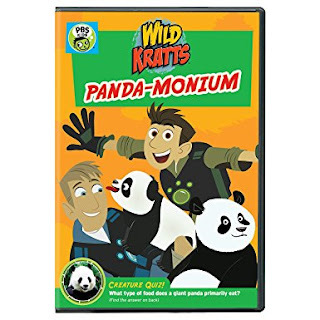 You can order Wild Kratts: Panda-monium DVD at Shop PBS, Amazon and other retailers. PBS KIDS, the number one educational media brand for kids, offers all children the opportunity to explore new ideas and new worlds through television, digital platforms and community-based programs. Kidscreen and Webby-award winning pbskids.org provides engaging interactive content, including digital games and streaming video. PBS KIDS also offers mobile apps to help support young children’s learning. The PBS KIDS Video App is available on a variety of mobile devices and on platforms such as Roku, Apple TV, Amazon Fire TV, Android TV, Xbox One and Chromecast. Click HERE to learn more about PBS Kids! Follow PBS Kids on social media! Kratt Brothers Company, founded in 1993, has created and produced more than 220 episodes of television, including award-winning series: KRATTS’ CREATURES, ZOBOOMAFOO, “Kratt Brothers: Be The Creature” and WILD KRATTS. Through its full service animation studio, Kratt Brothers Company is currently in production on its fifth season of the Emmy-nominated hit WILD KRATTS. Click HERE to learn more about Kratt Brothers Company!